For the vast majority of amateur and semi-pro producers, there's more than enough here to get the job done. Style presets are well realised. Easy to use. Great sounds. 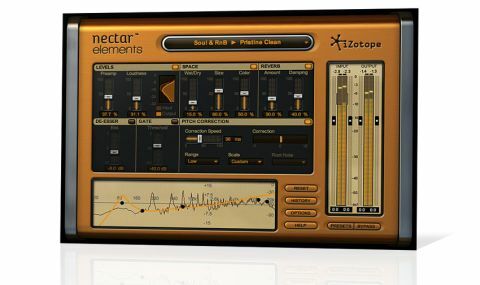 A cut-down version of iZotope's £209 Nectar vocal processing plugin, Nectar Elements is aimed at the 'home' user (ie, non-technical singer-songwriters, video producers, podcasters, etc) looking to get their recorded vocals sounding great with a minimum of manual involvement. While the full Nectar offers the wealth of options and parameters that you'd generally associate with iZotope's plugins via its Advanced mode, Elements is essentially Nectar's Overview window minus a few bits and pieces. It boils the full Nectar experience down to the essentials, with ten under-the-hood processors controlled via seven modules (with a few pop-outs). "The six main modules comprise Levels (saturation and compression), Space (reverb), De-Esser, Gate, Pitch Correction and five-band EQ"
In fact, sometimes, simply calling up one of the 100-odd Style presets will be all the user input required. These are divided up into 12 genre-based categories, including Dance & Electronic, Pop, Rock, Voice Over & Dialog, etc, and the library can be expanded with add-on packs, of which there are currently three available for free. The six main modules comprise Levels (saturation and compression), Space (reverb), De-Esser, Gate, Pitch Correction and five-band EQ. The seventh is context-sensitive, depending on the current Style preset, making available two parameters from a fixed bank of under-the-hood effects, including the descriptively named likes of Sizzle, Decade, Intensity, Tape Echo, Fidelity, Presence and many more. As you can see from the screenshot, the parameters on offer for tweaking are few, but the engine running in the background adapts to cater for each Style preset, adjusting the compressor response or saturation style, say, or the reverb algorithm used by the Space module. Nectar Elements fulfils its promise of balancing ease of use with just enough depth and flexibility to make it a serious and versatile tool for vocal production. It is, of course, quite severely hobbled in the 'details' department in comparison to its big brother, but the Style presets are well designed and relevant, and, most importantly, that legendary iZotope sound quality is fully evident.